Chevron said the oil field may be a "significant discovery"
Three companies led by US-based Chevron say they have found an oil field under the Gulf of Mexico that could boost US reserves by more than 50%. Drilling at a test well yielded "a flow rate of more than 6,000 barrels of crude oil per day", Chevron said. The discovery may rival the biggest US oil field in Prudhoe Bay, Alaska. Experts caution that the true size of the oil field is not yet known and it will be a long time before any of the oil there enters the market. "In the last 15 years, there've been so many great projects that started out and then petered out," Matt Simmons, the head of a group of energy investment bankers, told Reuters news agency. Recently in the Gulf of Mexico, "there's been a lot more bitter disappointments than phenomenal surprises", he said. The head of an energy consulting firm, Art Smith, told the Associated Press news agency that despite the discovery, the US will still be importing more than 50% of its oil needs. "The US still has a big difference between its consumption and indigenous production," Mr Smith said. Experts said the oil from the well is unlikely to be available for many years and the discovery is not going to ease spiralling global oil prices. Three firms - US oil giant Chevron, Norway's Statoil and US-based Devon Energy - said test results under the Gulf of Mexico "may indicate a significant discovery". "The full magnitude of the field's potential is still being defined," Statoil said. 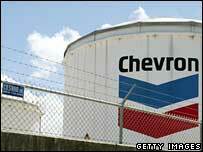 Chevron first revealed it was prospecting for oil in the area in September 2004. The oil field is located 435 km (270 miles) south-west of New Orleans and 282 km (175 miles) offshore. According to John Kilduff, an analyst quoted by the AFP news agency, the new oil field could produce 400,000 barrels for 20 years - even at its lowest capacity.